You are here: Home » News » News & Updates » Welcome to the Team: Our New Apprenticeships! ← Giant Fighting Robots? Let the Battle Begin! Welcome to the Team: Our New Apprenticeships! Our team of experts pride themselves on delivering only the best and most dedicated service, whether it&apos;s a special wire form or one of our torsion springs, we provide the same level of commitment to quality. As such we feel it&apos;s of paramount importance to ensure that all of our staff are trained up to a specialist level where they completely understand not only their own department, but are familiar with the processes throughout. 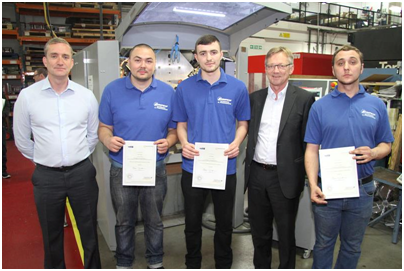 Well, after much hard work and dedication from our apprentices, European Springs & Pressings Ltd are very pleased to announce that three more apprentices have passed their apprenticeships with the company. So please welcome to the team, Daniel Gillam, 22, Vincenzo Ciacciarelli, 23, and Joe Cussell, aged 19. Seen here, being handed their certificates by group CEO, Kjell-Arne Lindbäck, the three new additions to the team can be extremely proud of themselves; as you may be able to imagine, we have a particular set of standards that we adhere to at European Springs, and all three have shown to us great promise in their field. However, it&apos;s not all down to our high standards, all three have achieved a nationally recognised qualification in performing engineering operations; they have accomplished this by systematically rotating through all areas of the business in order to gain the relevant skills required. Now the apprentices have attained this level, they will specialise in the areas of the business where they showed most promise and interest, and continue to develop their skills as spring technicians of the future. We feel it&apos;s important to have the team work in the area where they are best allowed to shine, and as such we feel that their enthusiasm and potential for the role will manifest itself through the high quality of work they are set to produce. European Springs & Pressings Ltd are very proud to be producing spring makers of the future who are able to satisfy the ever-increasing requirements of their customers. In doing this our new team members are strengthening their already wide skillset and setting foundations for future growth and development within the spring industry. We are excited about the potential of each of our team members, as we only seek to hire and produce the best, so we know the future is bright. So, if you would like to discuss the potential for joining our professional team, or would even like to discuss the possibility of seeking our services, don&apos;t hesitate to get in touch. You can contact us on 0208 663 1800 where one of our friendly team will be eagerly awaiting your call.